Much like the first two volumes, this one has four stories within. 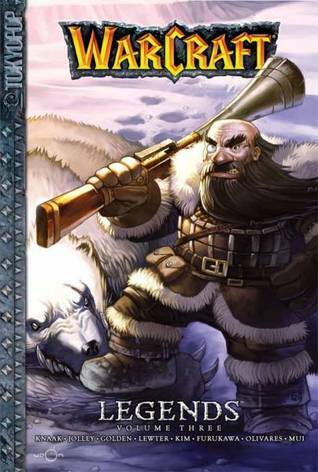 One of those stories is a continuation of Trag Highmountain, which started in the first volume. I will admit, I haven’t been much of a fan of Trag’s story. I think my biggest problem is that the font used for this story is so awkward that it makes reading it next to impossible. It’s hard to really get into a story when it’s difficult to read what is being said. Sometimes, with graphic novels, you can figure out a good chunk of what is going on based upon the images, but that little bit of dialogue and descriptive text is also very important to the story. If I have to hold the book an inch from my face and squint in order to read the text, then it’s hard to get into, let along enjoy, the story. The second story, Crusader’s Blood, was pretty enjoyable. I’m a big fan of the Undead race in the game, so any story that involves them tends to grab my attention. Throw in some Blood Elves and it’s even better. This story has quite a good arc to it, bringing things full circle and had very good art to go along with it. The third story was I Got What Yule Need. Let’s just pretend this one didn’t happen. Goblins are just wrong. Moving on. The final story, The Thrill Of The Hunt, was my probably my favorite, along with the second story. This is the story of Hemet Nesingwary. Anyone who has played World of Warcraft knows who this character is and the annoyance of his quests. However, this story goes beyond his love of the hunt and shows a different side of Nesingwary. Honestly, I never thought I would want to know more about Nesingwary until I started this story, and now I wish there was more. Overall, this was an enjoyable book. Some stories I liked more than others, but that is to be expected when several authors and artists are involved. It was a quick read and definitely something many World of Warcraft fans are bound to enjoy. I will be continuing on with this series to see what other stories happen in future volumes. This entry was posted in Books, Fantasy, Graphic Novel, World of Warcraft and tagged Book Review, Books, Fantasy, Graphic Novel, World of Warcraft. Bookmark the permalink.